Thursday 14th June saw almost 150 runners make their way to the University of Ulster in Coleraine for the Boom 10k hosted by Springwell RC. The monies raised from the evenings racing were in support of the Boom Foundation which was established in 2013, following the death of Philip Wilson from sarcoma. The two lap course started on the Cromore Road, going towards Portstewart before turning onto the Dundooan Road and along Portstewart Road, across the Boulevard to Millburn Road, and finally along the short incline back up past the University where the second lap commenced. Upon completing the circuit, runners were filtered into the University grounds and through the finish gantry. A leading group of five quickly formed from the start with John Paul Williamson and Matt Doherty (City of Derry), Eoin Hughes (Acorns AC), Kent Swann (North Belfast Harriers) and Paul Thompson (Springwell RC) setting the early pace. As the race started the second lap it was John Paul who established himself in the lead with Eoin and Matt contesting second place. John Paul maintained his lead to claim victory in 33.22, Eoin continued his recent good form, finishing second in 34.11 with Matt third in 34.24. Paul finished fourth in a time of 35.29 with Kent no far behind, finishing fifth in 35.33. 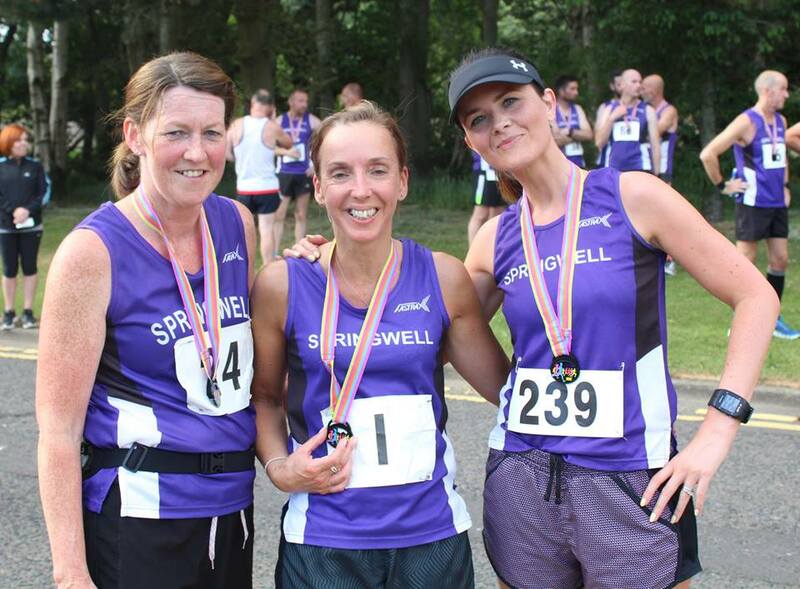 In the ladies race Deborah Gilliland (Springwell RC) dominated the race from the start, claiming victory in 40.52 and 17th overall. Nicola Frizzelle (Springwell RC) finished in 43.28 for second place and 28th overall. Caroline Irwin (Springwell RC) completed the podium in 44.04 and 32nd overall. The 10k in Buncrana on Saturday 16th June saw Springwell RC’s Ciara Toner produce another fantastic performance, running a 36.18 to finish as 1st lady, fourth overall and breaking her own Springwell RC record for the distance.